Iwi creatieve ruimte opend haar deuren voor de eerste keer op 1 Februari. Kom langs en deelnemen aan een creatieve workshop of gewoon kennismaken met ons project. De ruimte zit binnen de Buurtcentrum Sterrenzicht in Utrecht. Het is bedoeld als een plek waar alles creatieve en talent ontwikkeling kunnen plaatsvinden. Samen met buurtbewoners, activiteit begeleiders en een grote insteek van de sociaal makelaars van Oost brengen we dit mogelijkheid naar jullie? He was born in buenos aires in a barrio or district called San telmo. He made his first debut as a pianist when he was 13 playing the background music for silent movies. Later working with Carlos gardel one of the most famous tango singers. Leaving his employment to play as part of Canaro’s orquestra. After a little time he left Canaro’s orquestra to replace an unreliable pianist in D'arienzo orquesta and together in 1935 bringing forward tangos with a very distinct difference in energy and tempo using the 2/4 time signature instead of the old 4/4 time. he didn’t begin playing in the tradition of another orquestra like firpo canaro or de caro revivalists, but created a sound that was particular and most definitely his own. he never had any instrumental solos apart from the violins that have a strong presence in any of the pieces you might hear. one of the easiest ways to pick Di sari out form the crowd. ‘Milonguero viejo’ is said to be a piece that encapsulates every of di Sarli’s style. In 1919, he put together his first orquestra. he joined Osvaldo fresedo orquestra for a time but then moved on to put together another group. 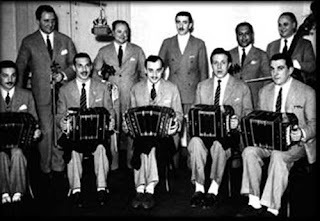 they played in various teas rooms until after a year they received a contract from RCA - recordings, a major contact in the world of recording tangos in that time. in 1936 he left his orchestra to go to rosario for reasons unknown. But his old orquestra in buenos aires still kept his name as they developed new music. 1938 he went back to being the leader of the Di sari orquestra. he went on with various labels to produce many pieces of music and his last recordings were made in 1958. hi first tango composition in 1919 was ‘meditation’. Generally thought to be self taught, amazing as he has created some of the best music in the tango genre. in 1924 he was one of the first band leaders to have a singer sing the 'escribilio' or bridge section of the music. Roberto diaz was the first singer he collaborated with for this. In 1925 Canaro went to paris taking singers Agustin irusta and roberto fugazot, and pianist Lucio demare. he recorded over 3500 numbers and from those the ones he composed were in their hundreds. 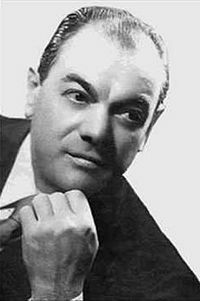 Canaro was active with the cause of intellectual property rights of composers from 1918 onwards and was instrumental in the creation of the argentine society of composers and songwriters in 1935. 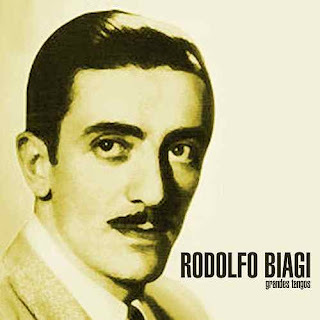 Later he developed pagers disease and died in buenos aires in 1964.
stylistically opposite to julio de caro and first playing violin with d'agostino on piano and lechuguita or ernesto biancha on bandoneon. Has first started playing for theatre and this continued further when d'arienzo-d'agostino band took over 'el cabaret el montmartre' from firpo. 1935 was the important year for d'arienzo due to this being the time he really became famous in the tango world. 1935 was also the time biagi joined d'arienzos orchestra. 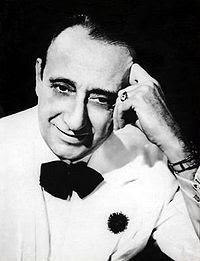 he became known as the king of the beat and is also thought to be the reason why tango become more widely danced again. during the 20s tango was taken over by singers and a slower more melancholy feel to the music that made music that was more for listening to. In 1949 D'Arienzo said: «In my point of view, tango is, above all, rhythm, nerve, strength and character. Early tango, that of the old stream (guardia vieja), had all that, and we must try not to ever lose it. he favoured the 2/4 time in his music and credits this with the return of dancers to the dance floors in 1940. Isolde kanikani @ Cielito. Powered by Blogger.